The Enterprise welcomes aboard a propulsion specialist and his enigmatic assistant, who are there to improve warp engine efficiency. When a warp test goes awry, the crew finds itself over a billion light years from home. Lieutenant Commander Argyle is the second Chief Engineer thus far. Interesting that Riker seems to indicate the ship has more than one. Kosinski is such an over-the-top egotistical jerk, but he definitely fits the mold of a snake-oil salesman who truly believes his own bullcrap. I love how nobody buys what he's selling, especially not Riker or Argyle. How come Kosinski doesn't wear any kind of insignia or communicator? It's weird that they talk about space and time as if they are two separate things. Einstein proved, long before the 24th Century, that they are not. When Wesley says they might be all part of the same thing--along with thought, which I grant is a pretty big leap--the traveler tells him to keep quiet about it because people just aren't ready for such "dangerous nonsense." I'd think 24th Century science would be a little more open-minded. "You could call it the Kosinski Scale." I heart Argyle. Data doesn't seem at all bothered by the fact that it would take over three centuries to get home, and why should he be? For an android, 300 years isn't necessarily that long. Those silly adults never listen to Wesley. Maybe Wesley's always going on and on about crazy stuff in the time between episodes, and it usually turns out to be nonsense. That's the only logical explanation I can think of for why everybody continues to underestimate him in the show. How do the navigational computers know how far away they are from the Milky Way? There don't seem to be any stars to go by, and according to Data, the computer never thought they were going faster than Warp 1.5. Picard stepping out of the turbolift into deep space is a mental image that has always stuck with me. 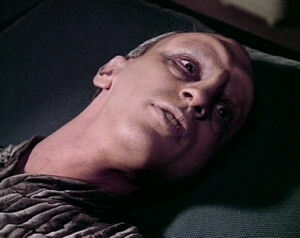 After seeing this episode, when I was younger, I used to open the door to my room with my eyes closed and hope that, when I opened my eyes, I'd see what Picard saw. Do the French have tea time? And why does Picard's "Maman" have such an indecipherable and undifferentiated accent? Picard's announcement is amusing: "What we think also becomes a reality. We must, therefore, begin controlling our thoughts." If your captain orders you to stop thinking, could you do it? At first, I was annoyed that Kosinski kept interrupting Picard's conversation with the traveler, but then I realized that it makes sense. Kosinski has been working with this guy for a long time, so of course he'd be desperate to be the one asking the questions. Thoughtful writing. "This could seem like magic to you." Clarke's Third Law. The bit where everybody has to think happy thoughts is really groan-worthy. All in all, I'm surprised at how much I'm enjoying the first season so far. Sure, a couple of these episodes have been rough (especially "Code of Honor"), but I'm having more fun that I expected. Maybe low expectations help. It's strange that they didn't assign a main cast member as Chief Engineer right off the bat. In fact, they don't until much later, when they give the position to La Forge. I'm still confused about the nature of warp ten. According to some sources (including an episode of VOY, "Threshold," if I remember correctly), warp ten is a barrier than cannot be broken because it is infinite velocity. However, in this episode, the Enterprise goes faster than warp ten. I'd also be remiss if I didn't mention the final TNG episode, "All Good Things...," in which several ships can go warp thirteen. They go two galaxies away and it would take over 300 years to get home at maximum warp. I'm not clear on how far apart the galaxies are (and I'm not interested in doing any real math), but that seems to scan with most Star Trek, especially VOY, where they say it would take over 70 years to get from one end of the galaxy to the other. I'm glad this isn't the last we see of the traveler. It's too bad we don't see more of Kosinski (aside from a brief mention of him in "Remember Me"), because it would be interesting to see what happens to his character after this episode. And so begins Wesley's journey. It's kind of sad thinking about how Picard molds him--as though he were a son--to be Starfleet, given how Wesley's story ends. Though Wesley's last episode--"Journey's End"--is kinda lame, I'm looking forward to "The First Duty," where he's under investigation for the training accident. That episode has one of my favorite Picard speeches of all time.